You know… I really hate health food some times! People just assume that if it is good for one, it’s good for all. And the FDA does a horrible job at keeping up with the need to label allergens. 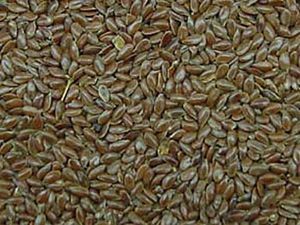 As much as EVERYONE is on the flax is the perfect food bandwagon, you have to be careful what you eat. Twice I have gotten very sick by eating/ingesting healthy things. The first time was when I took a natural decongestant when I lived in TN. It had bee pollen in it and I blew out an ear drum a few weeks before moving away to grad school. The other time was, at the instance of a then-boyfriend who was a health food freak, when I started taking flax-seed oil supplements and eating bread made from flax-seed. He insisted that it was a “bad” batch of flax until I found a site from Andrew Weil that said it was possible. I didn’t want to go to the ER so I made him stay up all night with me, to make sure that I could breathe as my throat closed. My point is, if you are intuitive at all, do your own research and go within to decide what you need to do about your own body… don’t let someone try to force you to do a treatment (of any kind) that you don’t feel is safe. Don’t fall for gimmicks that promise the moon and will most likely not even deliver moon rocks! Here is a blog post that disguises her experiences with flax. Learn from our lessons. When in doubt, research, research, research!